Episode 13 English. Ange is short for angel. Palmon + O This Angel Digimon brings happiness! Has the power of "sky"
Palmon + O He hits evil with his shining fist!! 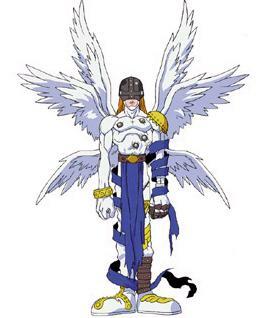 Has the power of "sky"
He cannot evolve from Virus Digimon He'll never permit evil! He buries his enemies with holy power! Has the power of "sky"
If you lose the battle you have the option to pick one of your opponent's face down cards and send it to the Dark Area. Wormmon + OX His kind heart is impartial...those who do evil must repent and reform! Has the power of "sky"
V-mon + OO A disciple sent so that all the Digital World might shine with the light of goodness! Has the power of "fighting"
Attack increases by 50 if Devimon is on the opponent's sheet.